To the business owner who's either purchased or sold a company in 2014, this video is for you. Ryan Steck, lead CPA at Ignite Spot, covers the tax consequences on your 2014 small business tax return if you bought or sold a business. As a seller of a company, this information is super important for your small business tax preparation. First, you're going to hear two terms: stock sale or asset sale. The sale of your business will depend on whether you're selling the whole company (stock sale) or the assets of that company (asset sale). 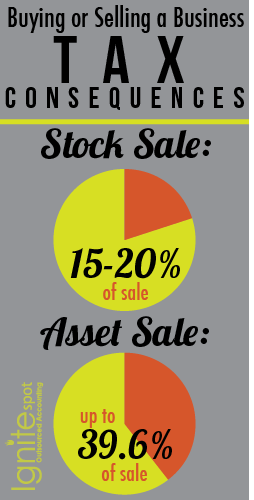 Selling on a stock sale means the tax consqeuence is either 15%-20% of that sale, depending on your tax bracket. This is the ideal situation for the seller. Selling your business on an asset sale basis means you pay ordinary tax rates on the sale of the business, which caps out at 39.6%. This really isn't a simple formula that a CFO can provide. Every company is different. These are just some suggestions of items to look at when valuing your company. There are also companies for hire who specialize in providing valuations for companies if you don't feel comfortable with this process yourself. One final word of advice: when valuing your company, look to other businesses in the same industry and see what they sold for. That will give you a rough idea of what your business is worth. Depending on your industry, your business type, and how you're appraised, your business sells for a multiple. For example, if you make $100,000 in gross revenue a year, and based on your industry or business, you sell for a multiple of 7, that means you could sell your business for $700,000. Every company and industry sells for a different multiple; it's wise to at least understand this term. Ryan: Hi, I’m Ryan Steck, and I’m the lead CPA here at Ignite Spot. Meghan: And I’m Meghan Fleury and I work in the marketing department. Ryan: Exciting times. Today, during tax season, we’re going to get off-topic just a little bit. But we’re still going to keep it with taxes. Today we’re going to talk about selling a business. You’ve taken time, grown a business that is very successful, you’re very proud of, but you’ve got other aspirations. Other things you might want to do it life. Or maybe you think that business has plateaued. Business owners, for whatever reason, at times in their lives decide they want to sell their business. Ryan: On the other end, people go out and decide they want to purchase businesses. They’re tired of their job, they’ve just left a company that they’ve built and sold. They go out and they want to purchase businesses. So, across the country, you’ve got people buying and selling their businesses. 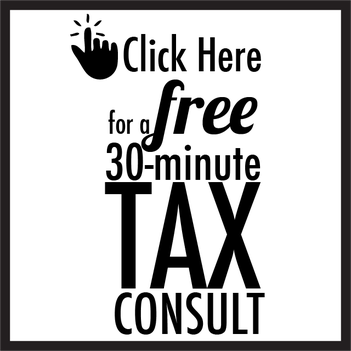 There’s tax consequences and some planning to consider when you’re selling a business. Ryan: And today we’re going to talk about 3 of those things. Today we’re going to talk about the character of the sale; what works for the seller, what works for the buyer. The other thing we’re going to talk about is your valuations, how do you actually get to what the sales price is going to be, and lastly, we’re going to talk about a word called multiples. Ryan: Ok, so first let’s talk about the tax consequence of selling a business if you are the seller. Ryan: So you’ve sold your business or are about to sell your business. What does that mean? Well it means that someone’s going to give you money for your business but the character of that money and what you’re actually selling in that business matters. Ryan: Typically, you’re going to hear 2 terms. You’re going to hear: stock sale or asset sale. So when you’re selling your business, are you selling the assets or are you selling the whole company? And depending on how you treat that depends on what your tax consequences will be. Ryan: Ok, so let’s start talking about an asset versus stock sale. You’re selling your business. How you sell this business makes a difference on your taxes. And can make a major difference on your taxes. Ryan: If you sell the entire company, generally what you’re doing is selling it on the stock sale. If you’re selling certain assets in the company, it’s just called an asset sale. Ryan: When you sell the company on a stock sale, someone is basically coming in and buying your ownership of the entire company and taking the company and moving it over to their ownership. What that does is leaves you subject to what’s called long term capital gains rates. Ryan: Which, right now depending on your tax bracket, is either 15% or 20%. So, long term capital gains rates on the sale of a business is generally the ideal that we’re looking for. However, if you do end up selling it, a lot of buyers want it to be an asset sale. There’s certain advantages they get if it’s an asset sale. Ryan: The problem with an asset sale is that you generally end up paying ordinary tax rates on the sale of the business. So for most sellers, they want to have a stock sale. And for most buyers, they want to have an asset sale. Meghan: Ah, so that can make some problems. Ryan: It can makes some problems and also, when you’re selling a business, lawyers are often involved and you don’t know what you’re looking at. Make sure you look at those legal documents. Because that’s important that you negotiate that between the buyer and seller before the actual transaction happens. Meghan: So what is the difference in consequence between a stock sale and an asset sale? Ryan: The consequence really depends on your tax bracket. As we’ve talked about, long term capital gains are 15% for most individuals, And, for what the IRS considers wealthy individuals, it’s 20%. Ryan: Ordinary taxes cap out at 39.6% to the IRS. So, that’s a pretty big difference and you can feel it, especially in the sale of a big business. Ryan: Ok, so number 2. We’re going to talk about valuations. When you’re selling a business, it’s worth something. Ryan: You’ve put a lot of sweat equity, blood, tears, into whatever you’ve created, it’s worth something. But what is it worth? That’s the question that everyone wants to ask: what can I sell my business for? What is it worth? Well, there’s a lot of companies out there that will do valuations. You can look at a lot of things too and kind of rough-out what you think your company is worth. Things you might want to look at when determining what your company’s worth is: how much are your sales every year? How consistent are those sales? Do you have recurring revenue? Or do you have one-off income that you have to try and go and regain after you’ve gotten through the first revenue cycle? So the consistency, the repeat of your business, what your revenue looks like, those are all important factors. Ryan: Other things people might consider is your infrastructure and your cost. How much do you have to actually invest to make this work? What is your risk reward? Are you highly intensive in capital assets? Do you have a lot of stuff that someone can buy? Or are you processes just labor heavy? All these things you have to factor in when valuing a company. What that looks like is different for every company. I can’t give you a magic formula. But start with those points and there are companies out there that do this professionally. Meghan: So you can just hire this service done if you want to go that route? Ryan: You can, and there’s a lot of different tools and a lot of different things you can look at if you want to try and stab at it yourself. Ryan: So, when you’re actually selling a business and trying to get a valuation, a lot of times a buyer wants to see what they can do with the business. And so, you may spend a lot on the business, but you many unnecessarily spend a lot on a business. And so when someone’s looking to buy you, they may think that they can do what you’re doing at a cheaper cost. They may think that they can do things to streamline your processes. Ryan: So just because you overspend on a business or on your expenses, doesn’t mean that’s what the business is worth. So it’s important you understand not only your total sales, but where you’re overspending. Because someone coming in lean will try and get those out of the process and that’s really a truer value of what your business is worth. Meghan: Ok. It makes sense. Ryan: Ok, the last thing we’re going to talk about today is multiples. Ryan: Interesting term but what does it mean? Ryan: When you sell a business, generally it’s sold for what they call a multiple. That can be a multiple of your gross revenue, that can be a multiple of your gross profit, that can be a multiple of your net income. Ryan: What does all that mean? It means that depending on your industry, depending on your business type, depending on how people appraise your business, it sells for maybe 1 times your gross revenue, maybe 7 times your gross revenue. So if you make $100,000 in gross revenue in a year, and based on your industry or other businesses like you and sell for 7 times multiple, that means that you could sell your business for $700,000. Ryan: So it’s important to understand your industry, do your homework, find other companies that are selling similar businesses to yours, and find out what multiples they sell at.